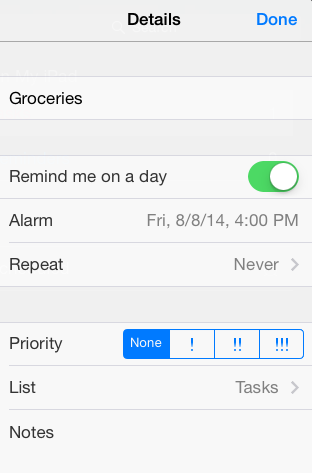 In the iPhone Reminders application, tap on any existing reminder to modify it. Reminders have several options some of which only appear after you tap on the Information symbol. In this Reminders display, you can specify a reminder on one specific day and time, edit the title, add notes about the reminder, reset the priority level, and change which calendar the reminder is associated with (List).